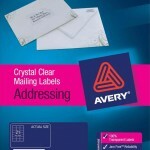 The solution to keeping your important papers protected is cleardiamond clear, in fact. 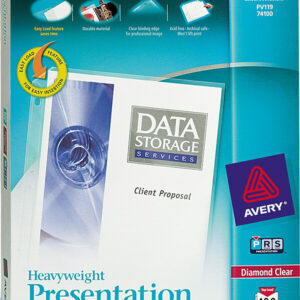 These Diamond Clear Heavyweight Sheet Protectors are designed both to protect your papers and show them off impressively. Diamond-clear material delivers a crisp view of your pages as well as durable protection. The acid-free and archival-safe material ensures your pages stay in top condition and that print remains on your papers, rather than transferring to the sheet protector. 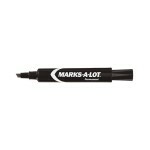 The protectors’ clear binding edge rounds out the professional look of your presentations and other documents. 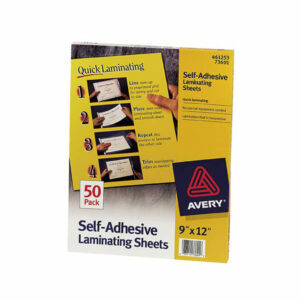 For quick laminating needs, these easy-to-use Laminating Sheets are the ideal tool. 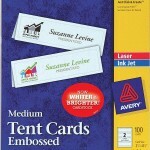 Each sheet is coated with self-adhesive for convenient, inexpensive lamination. Simply use the included grid to size the document, place the document on the adhesive side of one sheet, lay the second sheet adhesive side down to seal the other side of the document and trim the edges. 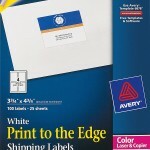 Soon you’ll have a beautifully laminated document that looks professional and will stand the test of time. 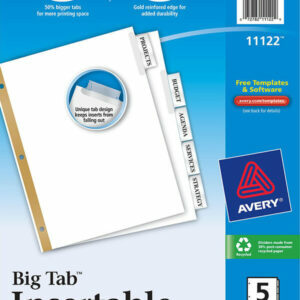 With WorkSaver® Big Tab™ Insertable Dividers, it’s easy to get the big idea. These tabs are 50% larger than typical tabs for even more printing space, so you can use sizeable fonts or even more lines of text on each insert. 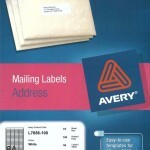 Use the free templates and fonts at avery.com/print to customize the tab labels and print them in minutes. A unique tab design keeps your inserts from falling out with the help of a secure indent point at the base of the tabs. The dividers stand up to pressure thanks to gold-reinforced holes that provide extra tear resistance.